On 20 November 2014 the United Nations will commemorate the 25th anniversary of the international Convention on the Rights of the Child. Caritas Internationalis will present the confederation’s work on behalf of minor migrants, who are either unaccompanied or accompanied by family members. Work done by Church institutions and other organisations close to Caritas that share its challenges and concerns will also be presented. Various types of documents will be posted on the Caritas Internationalis website, as some Caritas already work directly with minor migrants, provide services and carry out advocacy, while others describe the situation in their own countries but do not provide services as this would be impossible within their national legal framework, or appropriate facilities are lacking. Three Syrian Armenian brothers, Eli, Joseph and Gabriel, were devastated when their mother and father decided to separate. There was no place for them in either of their parents’ new lives, so they ended up in the Armenian orphanage in Aleppo. Thanks to the Armenian Ministry of Diaspora, Eli, the eldest brother, was offered a place at a commercial university in Stepanakert in Nagorno-Karabakh. He began studying there in 2011. His two brothers, Joseph and Gabriel, stayed behind at the orphanage. Then civil war broke out in Syria, affecting the Armenian district of Aleppo, including the orphanage. When Eli heard news of the strife in Aleppo, he rushed there to rescue his younger brothers, but was only able to bring 17-year- old Joseph back with him. Eli had saved hard to buy Joseph’s plane ticket. The journey was also tough as Turkey didn’t allow Syrian planes to fly over its territory, so they had to go first to Iraq and then Iran before getting to Armenia. When they arrived, the Armenian Ministry of Diaspora asked Caritas Armenia and Archbishop Rafayel Minasyan, the head of the Armenian Catholic Church, to help the orphans with shelter and living expenses. The Archbishop arranged for the boys to be housed in the diocesan building, where they were given food, shelter and transport expenses. Caritas Armenia’s Migration and Development Programme also supplied them with clothes and other essential items. The two brothers share a 12 m² room, with beds, a wardrobe and a heater, as well as a bathroom and a toilet. They have no kitchen, so they eat with the priests at the Catholic diocesan centre, and sometimes watch television in the priests’ recreation room. When Joseph was still in Syria, a mine had exploded at the orphanage on the balcony of the room he was staying in. He wasn’t afraid of the explosion, but the younger orphans were. He recalls seeing protestors kill someone in front of the orphanage. Joseph dreams about becoming a professional footballer and playing for AC Milan or Real Madrid. He played football at the orphanage and his team won a football trophy. A social worker from Caritas Armenia’s Migration and Development Programme helped Joseph enrol at the 139 High School in Yerevan. Many Syrian Armenians study there. Syrian students find the Armenian language hard when studying physics, chemistry and mathematics, so Joseph has opted for humanities. 20-year-old Eli, the eldest brother wants to bring his younger brother Gabriel, who’s still in Aleppo, to Armenia. For various reasons, he couldn’t bring Gabriel back with Joseph, and it’s no longer safe to leave the orphanage, according to its director. Syrian opposition fighters kill Armenians, as they believe they support the Syrian authorities. 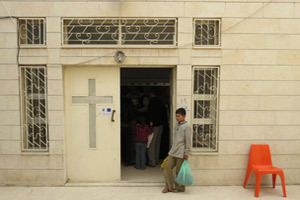 According to the boys, around 16 orphans are living in the Armenian orphanage in Aleppo. As well as reuniting with their younger brother, Eli dreams about becoming a priest in order to serve God. He’s used to living under different regimes and rules, so a priest’s life wouldn’t be hard for him, and he wants to attend the Ejmiatsin school for priests. He speaks English and Arabic, but he’d also like to learn Armenian and Italian. Founded in 1995 by the Armenian Catholic Church, Caritas Armenia focuses its domestic efforts on social protection and care; community-based development programmes to improve living and educational conditions; improvement of public health for the most vulnerable social groups; migration and integration including implementation of sustainable reintegration measures for returnees; and humanitarian and development activities. Caritas Armenia’s Emergency Support to Syrian Refugees project is aiming at supporting of 100 vulnerable Syrian refugee families, who have found refuge in Armenia. It enables vulnerable Syrian-Armenian refugees to access secure and healthy living conditions and to ensure their safety and well-being.